On June 10, the world lost another veteran of the 20th century struggles for freedom and democracy. 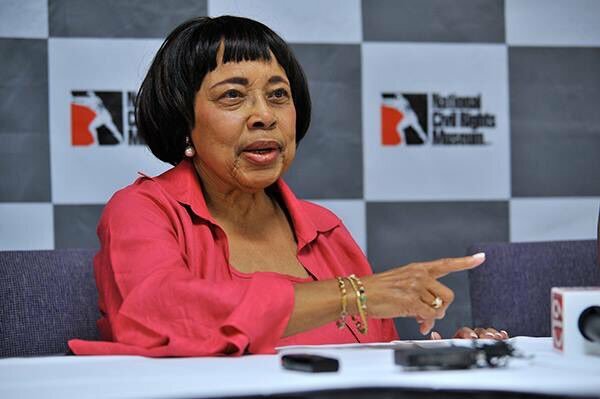 Dorothy Cotton, director of education for the Southern Christian Leadership Conference, or SCLC, when it was led by Martin Luther King Jr., passed away at the age of 88. As an invaluable member of a legendary team of preachers and organizers, she was one of the few women at SCLC to have served in a senior leadership position. Amid the efforts to register black voters in the segregated South, SCLC came to realize that registration was not enough for a population that had been disenfranchised for centuries. Cotton wanted people to understand the mechanisms of a government that had never really represented them or their interests and, ultimately, make that government their own — a process that would involve much more than voting. 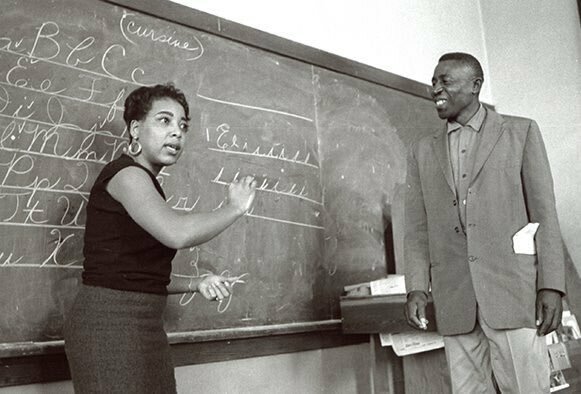 She devoted herself to this work in the 1960s, ensuring that black people were taught black history and lessons important to economic empowerment, alongside classes on the constitution and ways to pass literacy tests. After the movement years, she went on to become the director of student activities at Cornell University and, among other things, supported students who were organizing in solidarity with the anti-apartheid struggle in South Africa. I didn’t meet Dorothy until long after she retired from Cornell. In 2012, Vincent Harding had asked me to join a historic delegation to Palestine that was being organized by the Dorothy Cotton Institute. I was uneasy about joining the delegation — which was mainly veterans of the black freedom struggles of the 1950s and ‘60s — but eventually agreed. It was a tremendous honor to be among such a remarkable group. Led by Cotton and Harding, the delegation was, in part, a testament to her commitment to education. Even before leaving, we read, discussed and shared insights. Since the delegation was composed mostly of African Americans and Jews, we delved into the complicated history of relationships between the two groups in the United States. But that was just one part of the journey we undertook together. I learned an incredible amount on that delegation, and I owe Dorothy a great deal for it. Perhaps one of the most significant lessons was one I didn’t notice I was even learning. Dorothy would use movement to push us forward during the more difficult moments of the delegation. She was modeling for me, and the rest of us, the role of music in the movement. She would sing because we needed it and call us to song because she needed it. I had learned about the important role of music in the movement before — that it gave strength and courage to weary and sometimes frightened marchers. I knew of the power of song, but the demonstrations of my generation had more chants than songs. To experience Dorothy Cotton leading us all in song, in an effort to renew our souls on a hot and exhausting day, is among the greatest blessings of my life. We sang often during the trip. 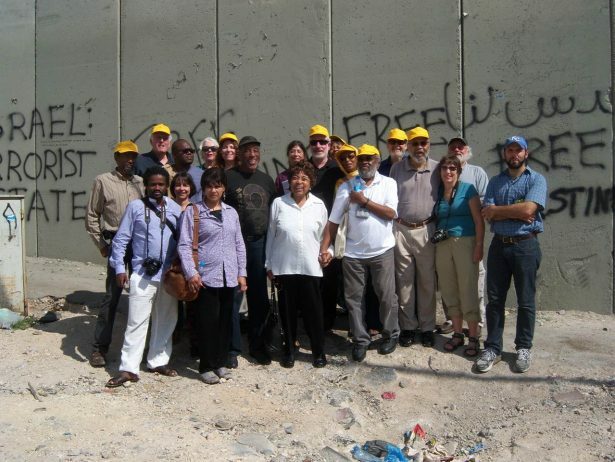 I don’t recall exactly when we began, but there was a notable moment for me in the West Bank, after our group of travelers had been listening all day to the painful stories of the occupation. We had heard of the destruction of homes, the stories of beatings, brutality and unequal treatment under the law. The truth of the occupation of Palestine is difficult for anyone to hear and see, much less a group of people who witnessed and survived similar treatment in the segregated United States. Our bus had stopped in front of the “separation barrier,” which interrupts the ancient route of the Jericho Road. We had gotten off to see the tear gas canisters marked “Made in the U.S.A.” The canisters added the burden of our complicity to the weight of all that we had seen and heard. In my memory, we were quite silent when we returned to the bus, and it was Dorothy Cotton’s singing that broke the silence. “Joshua fit the Battle of Jericho, and the walls came tumblin down.” It seemed at once an expression of lament and a defiant call to hope. The song represented a strange juxtaposition of time: the story of the ancient Israelites, carried in a song composed by our ancestors while they were enslaved, being sung in a location closer to the original story, but at a time far removed. Palestine in 2012 was also quite far from the movement years of the 1960’s. But the lessons Dorothy Cotton, Septima Clark and others involved in SCLC’s Citizen Education Program could be felt in that moment. They understood the importance of vigilance in the struggle ahead. Then, as much as now, in order to transform the world, we have to see ourselves and each other differently. We will need to believe ourselves capable of something more than the dehumanizing roles our society has given us. We have to look beyond the caricatures of ourselves, caricatures that we are so often tempted to become. In 1960, that meant that African Americans needed to free ourselves of the beliefs we internalized about our own inferiority, our own criminality. This was the importance of black history in the citizenship education workshops. The lies told about us for centuries were so pervasive and so penetrating that even if they had stopped 50 years ago, the struggle to free ourselves from them would still be necessary. For all of us in this country, and most especially for white Americans, our task was and still is to free ourselves of the corrosive myth of white supremacy — a myth that has touched every fabric of American life from local economic structures to foreign policy. It is a myth that so distorts one’s sense of self that it has the power to suppress empathy, perhaps the key component of our humanity. We know today, as clear as ever, that this myth is not easily defeated. This was the vigilance for which Dorothy and others prepared us. They knew democracy, equality and freedom would not be secured by the right to vote. To have considered this and prepared for it at a time when people were being killed for such efforts is a testament to the remarkable foresight and tenacity within the movement. Dorothy’s vigilance and commitment to freedom is what inspired her to travel to Palestine while in her 80s. She was unsatisfied with the official narrative of events. Through the pain of what we saw, the difficult conversations we had upon our return and the relationships we risked to tell the truth, she wrestled alongside us. Dorothy demonstrated a consistency of courage, even at a time when she could have rested on her well-deserved laurels. She modeled a life dedicated to the destruction of walls that divide us, and she was anchored by the belief of who we could become. I will remember her and celebrate her life not only because of who she was in the 1960’s — and the sacrifices of her generation that made my life possible — but also because of all she continued to be. She taught us how to be a citizen and how to be more fully human, even until the end. First published by Waging Nonviolence. Included in Vox Populi with permission. Lucas Johnson is the International Coordinator of the International Fellowship of Reconciliation. He grew up in the United States and currently lives in Amsterdam. A wonderful read – so often remarkable black women are buried by the mass media. This entry was posted on June 22, 2018 by Vox Populi in Opinion Leaders, Personal Essays, Social Justice and tagged African-American history, civil rights leaders, Israeli-Palestinian conflict, Lucas Johnson, Martin Luther King Jr, National Civil Rights Museum, relationship between Jews and African-Americans, Remembering Dorothy Cotton freedom educator, Southern Christian Leadership Conference, Vincent Harding.